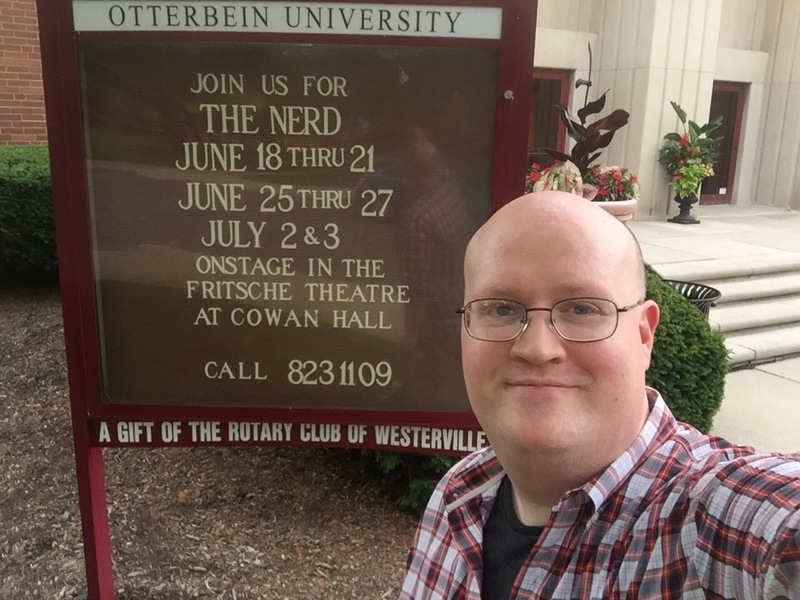 First performed in 1981 in Milwaukee before becoming a hit in London in 1986 and then Broadway in 1987, Larry Shue’s The Nerd is the story of Willium Cubbert (Jeff Gise), a thirty-four year-old architect living in Terre Haute, Indiana, and his friends Axel (Connor Allston) and Tansy (Afton Welch), and how their lives are disrupted when Rick Steadman (Ben Folts) arrives for an indefinite visit. You see, Rick saved Willum’s life during Vietnam, but Willum never got to meet him; now Rick has arrived with little warning on the evening when an important business dinner is being held with Willum’s hotel magnate client Warnock Walgrave (Evan Moore-Coll), who brings along his nervous wife, Clelia (Lauren DiMario), and stubborn child, Thor (Kellan Behrens). Mayhem ensues as Rick is incredibly inept, obnoxious, and seemingly unaware of how he is frustrating everyone in his vicinity. Rick doesn’t leave, and his past connection with Willum prevents Willum from being blunt about the situation, until he is finally driven too far. The Nerd is very funny, with moments so embarrassing that I felt the need to look away at times. It is all performed on one well-designed set intended to be Willum’s apartment, and the action takes place in November of 1984. It is important to keep the play stuck in 1984 as a clunky large answering machine, which figures largely in the plot, is artifact of that era, and I don’t think as a culture we are as sensitive to other people’s feelings as we were back then. If updated to 2015, I can see Willum easily dismissing Rick after the first night and finding a way to use technology to keep him out of his life, hurt feelings or not. Ah, but then we wouldn’t have this funny, slapstick-y play to enjoy, reminiscent of Kaufman & Hart’s The Man Who Came to Dinner in some ways. 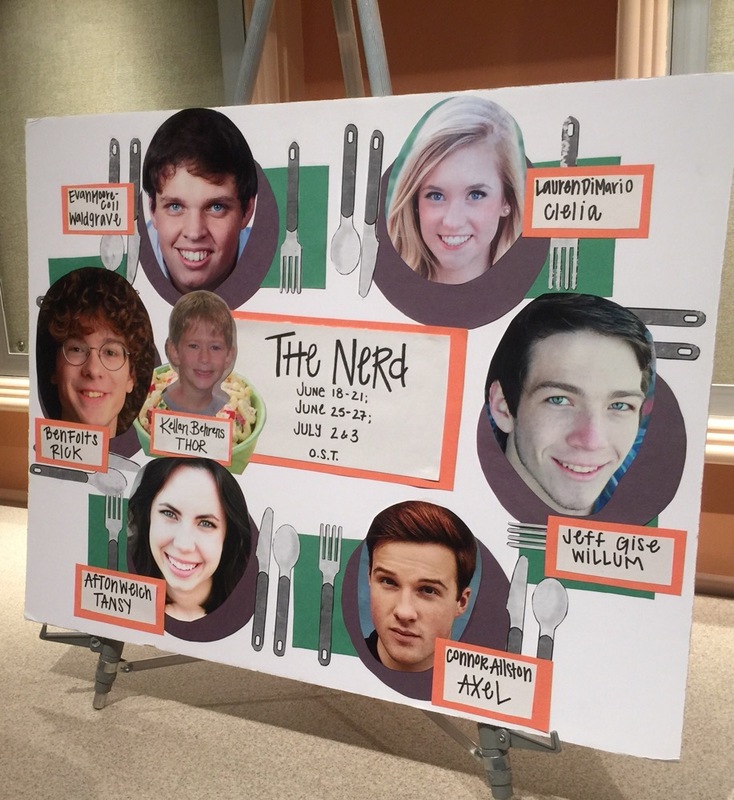 Aside from the last few minutes which I felt were not well written, The Nerd is a fun, well-constructed little comedy. It was a great choice for the Otterbein University Summer Theatre series. 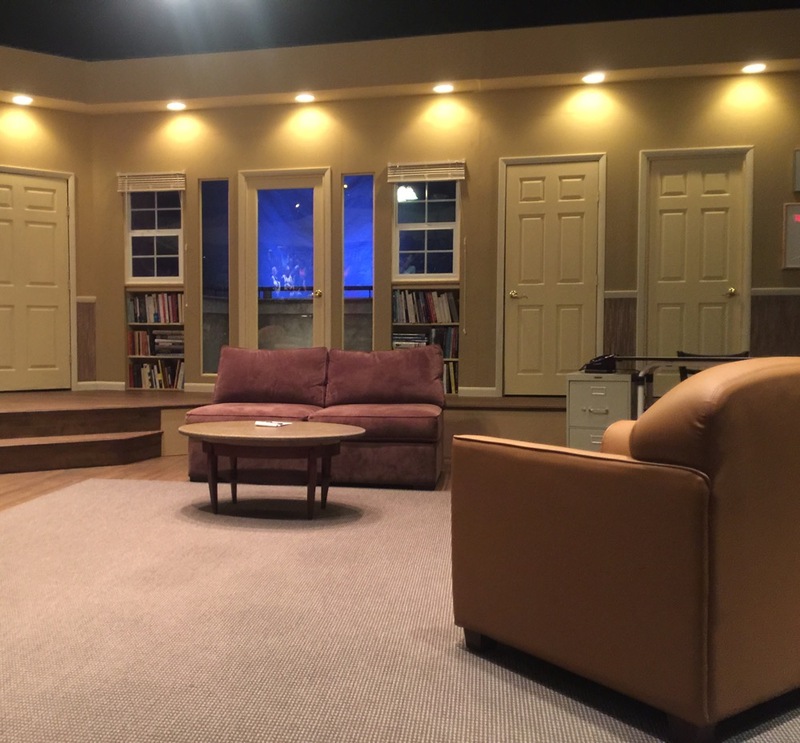 Otterbein University’s Summer Theatre series is performed with the audience seated on bleachers in the front and to the left and right of the performers, with the cast and patrons all on stage together in the Fritsche Theatre at Cowan Hall. The performers are incredibly close to the audience, and it’s difficult not to be engaged in the story when you feel like you’re nearly a part of it. The cast is made up of students playing parts far beyond their years, but by and large they acquit themselves quite well. Jeff Gise plays Willum very straight, which is the only way the chemistry can work between him and Ben Folts as Rick. As Ben eats with his bare hands out of the macaroni salad and picks at the bottom of his shoes in front of company, Jeff’s turmoil is real, and he even starts to sweat pretty heavily (as does Evan Moore-Coll) when Ben is being frustrating beyond belief. Then again, I did see the opening night performance and perhaps that contributed to the sweating, but I really don’t think so. Jeff and Evan only started to melt when Ben began to drive them up the wall, and it made everything more real – and funnier. I’ve never been a fan of the type of cruel humor seen in films like Meet the Parents or The Money Pit where destructive mishaps are supposed to be funny, but The Nerd doesn’t cross the line into being overtly cruel or truly distasteful, another difference in the type of comedy that has grown in prominence in the more than thirty years since this play was written. Ben Folts as Rick Steadman plays the part of the nerd to the hilt, wearing clothes that are so ill-fitting and mismatched that they need to be seen to be believed (costume designer Julia Ferreri is to be applauded – and feared!). And yet, Ben sings, plays his tambourine, and eats off the plates of others as if it is perfectly natural and surely shouldn’t bother anyone. If he played Rick as intentionally annoying rather than with such honesty at being socially inept then the comedy wouldn’t have worked. I have to give credit to director Melissa Lusher for that as well, and for keeping everyone from overacting and the play moving at a brisk pace. Comedy isn’t easy, but these kids performed it like pros, with Lauren DiMario particularly affecting as the nervous Clelia who likes to break things to relieve her stress. It always tickles me to recognize actors from prior productions, and Connor Allston (Axel) I remember from last year playing the lead in Otterbein’s The Full Monty where he more than held his own among a terrific cast of guys. Connor has less to do here, but he wears his Miami Vice-inspired costume and hair with confidence and keeps things moving when Ben and Jeff aren’t on stage. He comes off as so natural and comfortable, and I hope to see him in future productions. Afton Welch as Tansy finds her footing midway through the first act, and from then on she is right in the thick of it, filling out the ensemble nicely. I enjoyed The Nerd far more than Clybourne Park a few weeks back (not because of the actors or production, but because I felt the writing of that play was uneven and tremendously overrated), and the audience reaction had me thinking that they felt the same way. This play does nothing more than try to make you laugh, with no deep thought required. There is no deeper meaning or special moral to the story, so we’re left with that which is enjoyable, and there’s nothing wrong with that.